The five elements theory started with the ancient Chinese calendar where five types of energies were assigned to different days, months and years. The energies were given the names of five elements – Wood, Fire, Earth, Metal, and Water. These Five Elements were associated with the equinoxes and solstices to help farmers plan ahead and organize their agricultural cycles. As you can imagine, having a calendar was of incredible benefit to an emerging agrarian civilization. So the calendar was arranged by using the names – Wood for the spring equinox, Fire for the summer solstice, Metal for the autumn equinox and Water for the winter solstice. The fifth element, Earth was at the center of the calendar. Human relationships to the cycles of the day, seasons and moon were of interest to traditional Chinese healers, and the Five Element theory became a fundamental part of traditional healing. Early writing on the Five Elements can be found in the classic Chinese text Inner Canon of the Yellow Emperor commonly dated to between the first and fourth centuries BC. 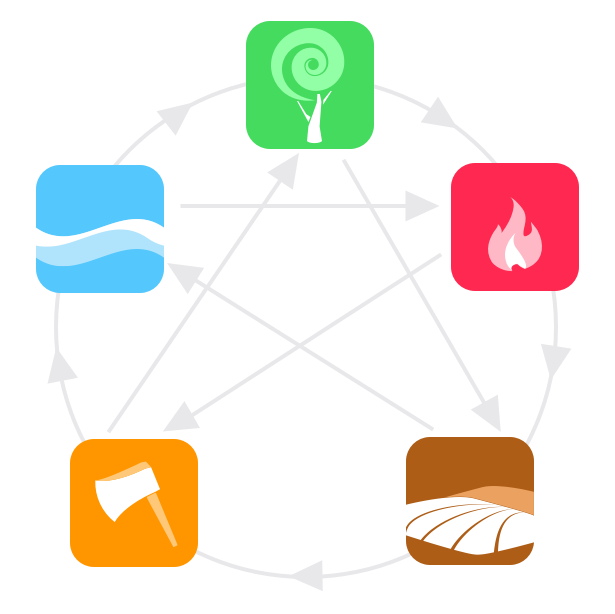 In a medical context, the Five Elements were arranged in a circle while Earth moved from the center to being part of the ring. The principles of the Five Elements became widespread and are fundamental in practices such as acupuncture, feng shui, shiatsu, chi gong, BaZi astrology and healing through foods. The basic principle of Five Elements is control and production cycles. Each element produces and controls another element, this way keeping the balance. But if one element is too strong and unchallenged, then the balance is lost. Five Elements are related to our organs. The Wood Element represents liver; Fire is a heart, Earth is spleen, Metal is lungs and Water is kidneys. Our emotions, like sadness, anger, happiness, joy, depression, are all results of our organ functionality. When they are balanced, we react more positively, when organs are out of balance, we behave more negatively. Our analysis follows these principles, by generating the values of each element from your date and time of birth, and applying corresponding values and characters to it, results in a very detailed blueprint of human nature and abilities.